With the quick rise in demand for Influencer Marketing, there is a need for tools and platforms to aid brands identify the right influencers and engage them. Many platforms have cropped up that either aid you to identify the influencers yourself via a DIY tool or connect you to the right influencers for your brand based on your requirements. Some of them are free while others are either freemium or paid platforms. Let us take a look at the top platforms to discover Influencers for your brand and help you connect and engage them in your marketing campaigns. Klout is one of the most well-known tools in the Influencer Discovery and Engagement space. Launched way back in 2008, it analyzes the social network presence of an individual to arrive at Klout score. Last year, the tool was updated to serve as a content curation and content discovery platform for users. BuzzSumo is a paid tool that offers content marketing plus influencer identification on a single dashboard. Quite useful for content marketing by brands, it allows you insights into what type of content works best in your industry / target audience. There are multiple subscription plans available based on requirements of your brand, with the basic plan starting at $79 per month. Influencers search has an option to segregate influencers based on different profiles like bloggers, journalists, etc. Kred is a paid tool for influencer measurement that helps you to identify and engage with influencers based on its Kred Scores. The metrics behind the Kred Scores is more complex in comparison to Klout. The platform provides two types of score- the main Kred Influence Score and the Kred Outreach Score. Community level influencer filtering like sports, technology, marketing, etc. A simple tool from the house of Moz, FollowerWonk is a search engine & analytics tool that focuses exclusively on Twitter for Influencer discovery and tracking. Rich engagement metrics and competitor influencers following are some great insights provided by the tool. Keyhole is a freemium Hashtag tracking tool to discover content & influencers associated with an event or campaign on social media. It can pull-out influencer profiles, conversations and top trending content using a particular hashtag. Influencer.in is one of the leading influencer marketing platforms with more than 25,000 influencers listed on the platform. The platform offers brand influencers across a wide range of categories such as lifestyle, fashion, sports, travel, healthcare, technology, etc. They also have an excellent Influencer 101 guide. Topsy is an interesting tool that allows you to track the influencers who are sharing a specific piece of content – it can be your competitors article, link or a tweet. It allows you to pull out all users who share a content relevant to your industry and automatically filter the most influential sharers. It supports upto 10 different languages that includes English, French, German and Spanish. The sixth edition of the Digital Chai Pe Charcha was held at our office on 27th August 2016. It received an excellent response with about 15 participants including entrepreneurs, professionals, digital marketers and social media influencers taking an active part. The topic of discussion was the secret to a successful Influencer marketing campaign. Word-of-mouth advertising has always been the most powerful tool, and influencer marketing is WOM Advertising 2.0. In simple terms, it means shaping the opinions about your brand using the most influential people amidst your potential customers. If you are a brand, you make friends with the most influential people at a place where you want to sell. Now, they talk about your brand and recommend you to their followers (potential customers). Given that word of mouth, marketing generates more sales than paid advertising; more brands are beginning to think about influencer marketing as part of their branding strategy. In the last 12-16 months, we have seen many interesting influencer marketing campaigns in India run by the likes of Cadbury, Allen Solly, Ford & much more. How to identify right influencer? For any influencer campaign, selecting the right influencer and partnering with them is crucial. Checking the influencer's reach is the first thing you would need to do. This can be measured in terms of the number of followers/fans or the number of visitors to their blog/posts. Always remember to choose quality over quantity. The following are the parameters you should be using while choosing the right influencer. Moz Domain Authority– This is a score developed by Moz that predicts how well a website will rank on search engines. Reach in Social channels– This will include page likes on Facebook, followers on Twitter, Google+ and YouTube. Estimated traffic from similar web – This tool provides user engagement statistics for websites. Blog Alexa Ranking – This tool provides commercial web traffic data and analytics. 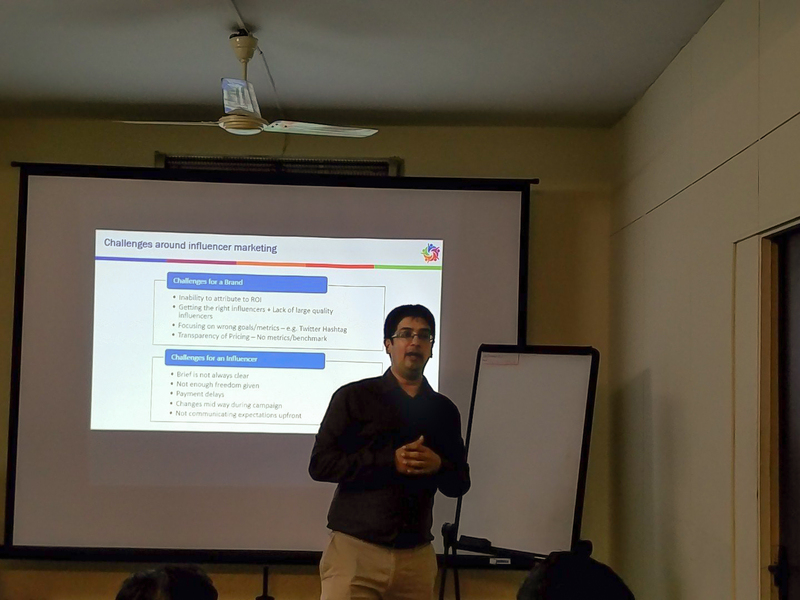 Based on our interactions with influencers, the survey we ran amongst influencers, and learnings from various events such as Social Media Week Bengaluru, there are a few challenges in influencer marketing. You can follow us on Facebook and Twitter! Check out the hashtag #DigitalCPC for more details on the next Digital Chai Pe Charcha meet. It was an interesting evening spent at MDI Gurgaon with students of Consumer Behaviour. We were talking about the role of Communities, Content & Influencer Marketing on Consumer Behaviour. See the below slide share for details on the discussion we had. The students had a lot of questions, especially around influencer marketing and its ethics. Many of these can be found in the FAQs of Influencer Marketing here. The latest buzz word in the digital marketing world that is steadily catching up with brands is ‘Influencer Marketing’. Western companies have leveraged this strategy of marketing for the past few years and the trend is quickly catching up with Indian brands as well. Brands in India have actively come up with successful influencer campaigns for the past 2-3 years. We also have a list of top influencer marketing campaigns that ran in 2017 and 2016. Influencer marketing is a term that has risen from the realization of brands about the power, peer influence and customer recommendation has over other forms of marketing. Especially in a time, where consumers have started using social media in huge numbers and have been public about their views about brands and products. Brands have realized that people are largely influenced by second-hand information from opinion leaders and this has led to a lot of brands identifying top influencers in their respective fields to try and reach out to consumers better. Once brands have identified Influencers in their particular domain, it is important that they find a means with which they can connect to them and make them speak about the particular product. The engagement plans have to be well thought out and shouldn’t look too commercial. Here are a few popular influencer marketing campaigns in India, that companies have used to engage and leverage the power and reach of influencers. One of the top influencer marketing campaigns in the country came from Lenovo for their Yoga 2 tablet range. Lenovo hired four famous twitter celebrities namely film critic Mihir Fadnavis, gadget guru Ankit Vengurlekar, actor Ashwin Mushran and food blogger Kalyan Karmakar. Rather than using these four influencers to simply do the customary sharing of features of the tablet, they were actually shown being trapped inside a box. The campaign invited consumers to answer questions and find clues that could help free their favorite Twitterati. Participants who answered all their questions rightly would win a free Yoga Tablet. A few mid-range twitter influencers along with Bollywood fashion and lifestyle blogger Miss Malini were roped in to promote Cadbury Glow which targeted the super-premium chocolate market. The campaign focused on the key aspect of Cadbury Glow which allowed people to share personalized notes, songs, photo albums and videos along with it. One of Miss Malini’s friend made a video for her and shared it on twitter which she retweeted bringing in a lot of traction towards the product. Philips had introduced its latest kitchen appliance Air Fryer in 2012 and there were very few who knew its application and use. It allowed deep frying of a variety of food items with 80% less oil consumption. Despite such a huge feature, the Air Fryer remained relatively unknown in the market. This is where Philips along with its digital agency Ogilvy One roped in Sanjay Thumma who is known for his cookery channel on YouTube called Vahchef. The campaign started a six month long show called “Philips Superchef” that managed to create a lot of awareness amongst consumers. Colgate launched its new SlimSoft Charcoal Toothbrush and decided to bring it into public view using an innovative and unique campaign. The campaign was for 3 days where key influencers targeted by Colgate were sent an item that was completely black in color each day. The first day was a black mug followed by a WhatTheBlack Times newspaper and on the final day the black charcoal toothbrush. At the same time Colgate also started a #WhatTheBlack contest on Twitter where bloggers and top Twitteratis had to write their top 5 black things without actually revealing anything about the brand or product. This led to a lot of speculation among consumers who came up with a variety of guesses as to what the product was going to be. These two campaigns brought about a great deal of attention to the debut of the Charcoal Toothbrush. The Madras Song was released by the Murugappa Group to celebrate the 375th anniversary of Madras. Murugappa Group teamed up with socialbeat.in and roped in bloggers from diverse fields to blog and talk about the song. The song went viral and within 5 weeks generated almost 2.5 lakhs views. Twitter hashtags like #FavMadrasMemory and #Madras375 Celebrations were created which turned out to become very popular among Chennaites. IBuyFresh’s campaign to reach out to its audience interested in cooking & recipes online invited influencers to visit their warehouse and blog their experience to help spread the word. The campaign received attention from local bloggers in the respective field and helped a great deal in popularizing the brand among consumers. Popular luxury hospitality chain Raintree started an interesting influencer campaign to promote their recently renovated hotels. They invited top travel bloggers to stay and share the experience to fellow travel enthusiasts following them. The campaign worked remarkably well in letting people know about the renovation and the various special services offered. Opera’s latest browser, Opera Coast had features that would change the way people would use a browser in the iOS. The browser was designed without an address bar, forward and backward button and other features that made it completely unique from any conventional browser. The campaign used kinetic sand which is a soft, stretchy and non-sticky sand that can be used to make innovative shapes. The brand identified a particular set of creative professionals as influencers which included artists, media & ad folks, illusionists, entrepreneurs and musicians. Each of the influencer was sent a surprise package containing kinetic sand and a personal note asking them to spend time making something with the sand. The influencers pleasantly surprised by the package, shared their experience about the iOS browser and also how they liked the surprise campaign. Ford launched Ford Fiesta Powershift Automatic via social media to promote the ‘Real People, Real Experience’ approach. It invited auto enthusiasts in the country to drive the newly launched car and thereby prompted them to share their experience through their respective media. The event was held in Buddh Racing track in Noida and the track was specially designed for drivers to discover the key features in the car. The list of people included bloggers, businessmen, photographers and designers who were all known to be auto enthusiasts. The campaign drew a lot of attention from people across various social media like Twitter, Facebook etc. To promote the brand’s entire chino range, Allen Solly came up with the #ShootforSolly campaign. The brand handpicked 22 people across 7 cities in India consisting of 11 eminent personalities and 11 budding photographers. The models were asked to pick up a pair of Allen Solly chinos and shirts and then coordinate with the selected photographer for a photo shoot to be planned completely by the model and photographer. Allen Solly not only managed to make the 22 influencers talk about the campaign, but also created a buzz about the chinos and how they suited different styles and body types. All these campaigns focused on the essential aspects of Influencer Marketing. They targeted the right influencers and built a campaign that would naturally make influencers directly or indirectly endorse their product. These campaigns are excellent examples of Influencer Marketing done right. Influencer Marketing–Final nail in coffin for traditional marketing? Voice of the Brand or Customers? Social media marketing has brought about a quantum shift in the way marketing is done. It has moved the focus from “The Voice of the Brand” to “The Voice of the Customer”. The balance of power in the purchase funnel is now more skewed towards the customer & his peers, slowly changing the way brands market themselves. Earlier, the entire focus used to be about roping in a brand ambassador and roll out your story. Today, your story is okay but what really matters is the story that’s going on between the millions of bubbles on the social cloud. Add to that, the “bigger bubbles”- the social media influencers, and you are in for a different game altogether. Yes, the above statistic is true, according to a McKinsey study. To delve deeper, they also result in 37% higher retention rate of customers1. Riding this trend of word-of-mouth/recommendation marketing, a form of marketing has gained prominence – Influencer Marketing. In simple terms, it means shaping the opinions about your brand using the most influential people amidst your potential customers. If you are a brand, you make friends with the most influential people at a place where you want to sell. Now, they talk about your brand and recommend you to their followers (potential customers). With the explosive growth of social media, the process explained above happens digitally. The influencers talk about your brand on social media channels like Facebook, Twitter or on their blogs, which impacts the purchase decision of their followers. How do you get to know if he/she is the “right influencer”? Who knows, he might be! Okay, so a brand wants to engage with influencers to talk about the brand and their product / offerings. But, who to connect with? It can be quite tempting for a brand to connect and partner with an influencer with large number of followers but is “number of followers” the right metric? Audience Relevance & Quality – The followers of the influencer might or might not be the audience you are looking out for. Example- If you are a lifestyle brand, targeting a premium audience, then it would pay to target influencers with a similar audience following. This approach can provide you a decent shortlist to kick-start the influencer marketing efforts for brand-building and lead generation. There are umpteen case studies that showcase how brands have been able to amplify their marketing efforts. Most importantly, it has not been the case only with the medium/smaller brands but the bigger brands too, are laying focus on influencer partnerships. Miss Malini makes Cadbury ‘Glow’- a case study! When Cadbury Glow was launched in India by Mondelez International, it turned to social media influencers to create buzz around the offering. It roped in Miss Malini and other Twitter Influencers to talk about Cadbury Glow, its special features like personalization with notes, songs, photos or videos. For example- Miss Malini’s friend did a video of her and uploaded on Cadbury website. The link was then shared and tweeted by Miss Malini. Start building influencer relationships before need them – it’s a coin with 2 heads! Building relationship with influencers and leveraging them, works on a foundation of quality offerings and superior customer experience. In cases of mismatch between expectations and offerings, social media easily amplifies negative sentiments about your brand. This not only puts your brand at stake, but also marginalizes the credibility of the influencers associated. It is possible for some brands that at this point you may not require influencer marketing. But, as the proverb goes – you don’t dig a well when you are thirsty. Drawing an analogy, this is the time to build a strong influencer network. Moreover, influencer partnerships act as a validator for your own content marketing campaigns. So you see it’s not a zero-sum game. One of the few ones that give you a win-win hand! Whether this rings the death bells for traditional marketing, only time will, tell but what’s for sure is that marketing shall never be the same again.